It didn’t take long for Michael Godsey, an English teacher at Morro Bay High School in California, to realize that his decision to use a public radio podcast in the classroom was a wise one. It wasn’t any old podcast he was introducing to his classes. It was "Serial," the murder-mystery phenomenon produced by reporter Sarah Koenig of "This American Life," which already was transfixing a wide swath of the adult population. Godsey is one of a growing number of educators who are using podcasts like "Serial" to motivate their classrooms and address education requirements set by the Common Core state standards. Improving students’ listening skills is one of the essential components of the new education mandates, and using audio in the classroom can be an effective way to promote listening. 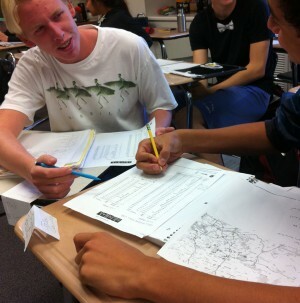 Students in Michael Godsey's class review cell phone logs from the Serial podcast. Credit: Michael Godsey. “It’s a really nice way to spend time together as a class,” says Eleanor Lear, a high school English teacher at a private all-girls school, who has been using podcasts from Chicago Public Media’s "This American Life" and WNYC's "Radiolab" for about four years. Powerful podcasts that tell good stories not only captivate students, Godsey adds, but also help them tune out the static of modern life. “I think the kids really appreciate getting the story told to them, as opposed to so much hitting their senses,” he says. “They’re not overstimulated by it,” he says, noting that contemporary podcasts resemble radio shows from the past. Learning through listening has surprising educational advantages as well. Students can listen to content two-to-three grade levels higher than they can read, according to Monica Brady-Myerov. She spent her career in public radio and now runs an online site, Listen Current, to help schools make better use of public radio’s rich strain of stories. * An unfamiliar word that might stop them on the page doesn’t compel them to tune out from a story told aloud. Also, kids for whom English is a second language benefit from hearing spoken English and following along with an accompanying transcript, she says. If podcasts are a modern version of old-time radio programs, then "Serial" is this generation’s "War of the Worlds." No one has packed up a car to escape fictitious aliens, as they did after listening to Orson Welles’ tall tale, but "Serial" listeners of all ages have been swept up by Koenig’s investigation into a decades-old murder of a high school girl in Baltimore. The podcast's first season consists of 12 40-45 minute “chapters” narrated by Koenig, involving interviews with former witnesses, detectives, lawyers and classmates of Adnan Syed. He was convicted of the murder of his ex-girlfriend, Hae Min Lee, and is now in prison. The series unfolds in real time — Koenig apparently is searching for answers along with the listeners — and challenges followers to wrestle with Adnan’s guilt, the criminal justice system and the events that unfolded around the day Lee was last seen alive, January 13, 1999. Last fall, "Serial" was the most popular podcast in the world, the Wall Street Journal reported, and set the iTunes record for fastest downloaded podcast. 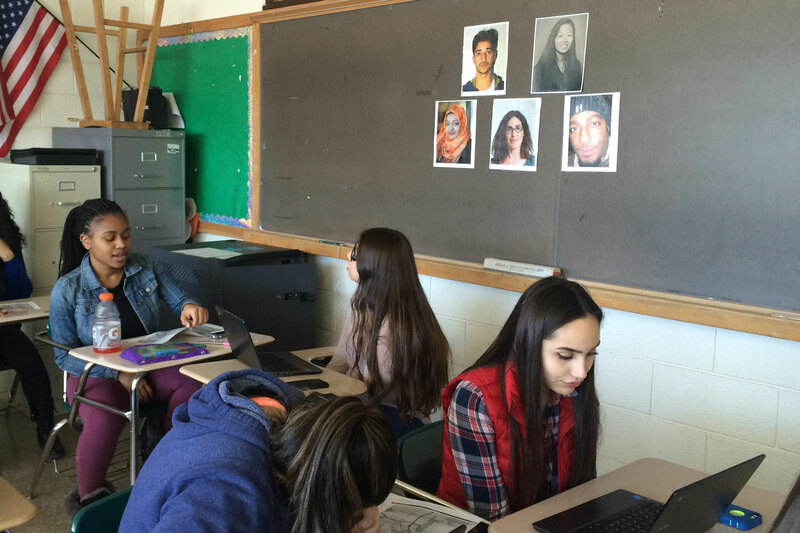 Students at Norwalk High School discuss the Serial podcast, while images of key players loom on the wall, including Adnan Syed, Hae Min Lee, Jay Wilds, Sarah Koenig and Rabia Chaudry. Credit: Credit: Alexa Schlechter. And "Serial" is novel, not only to the kids, but also to the teacher. “It was new to the world, and they were very excited that I didn’t know the outcome before they did,” Godsey says. 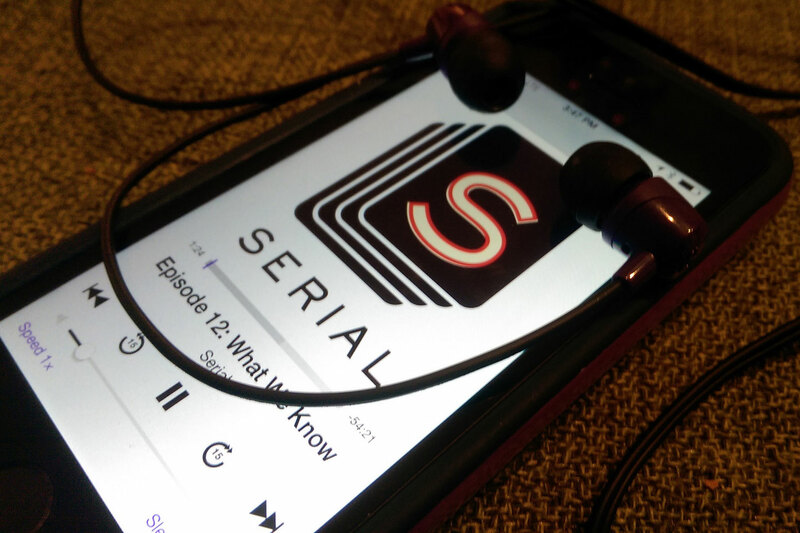 When the semester ended, 90 percent of his students reported enjoying "Serial," some suggesting that they preferred podcasts to written stories, novels or poems. What do students learn from the experience? 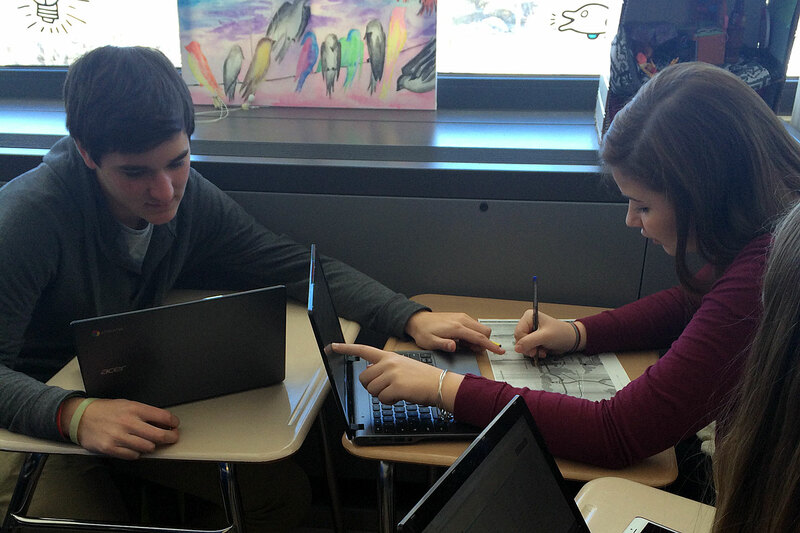 “They enjoy it so much that they don’t realize they’re learning at the highest level,” says Alexa Schlechter, a 10th-grade English teacher at Norwalk High School in Connecticut, who had never used a podcast in class before trying "Serial." Listening to and engaging with "Serial" helps many students address one of the main challenges in developing their analytical skills: getting beyond simple explanations of what happened, and figuring out how and why an event occurred, she says. Poring over text of the transcripts in class to uncover answers, students also develop their critical reading skills, she says. (See how students answered questions about discrepancies between the cell phone records and Jay's testimony at Schlechter's blog.) Students publicly debated Syed's guilt or innocence in Godsey’s classes, addressing a Common Core standard to improve speaking skills, and worked together with other students to create their own podcasts or present mock closing arguments. Teachers were similarly inspired, if occasionally overwhelmed by the out-of-class preparation required for such pioneering work. Godsey and Schlechter both were hooked on "Serial" when it dawned on them to share the learning experience with their classes, and their personal enthusiasm for the story drove their teaching. The energy and originality of the podcast inspired them as much as it did the students. Because the case revolved around high school kids, teachers also were better able to appreciate their students’ contributions and point of view, in a way they might not have had they been discussing "The Great Gatsby" or "War and Peace." In this way, "Serial" helped teachers better grasp their students’ fresh insights. And devoting so much class time to this one complex story triggered ideas for new ways to discuss the classics. Next semester, Godsey’s English classes are going to do their own "Serial"-style podcast, telling Arthur Miller’s "The Crucible" from Abigail’s perspective. Even the violent subject matter brought unexpected grace to the class. The humanities, after all, dwell on the conflicts within and among human beings, but novels and distant nonfiction can feel unconnected from teenagers’ lives. "Serial," on the other hand, with its focus on the actual murder of a young woman and the current imprisonment of her convicted killer, forces listeners to confront -- and feel -- the reality of human frailty. For her part, Schlechter is determined to keep the murder victim present in her students’ minds, so that the young girl at the center of the mystery isn’t lost in the class exercises. “I keep a photo of her in the classroom, so she’s not just a subject, or a character,” Schlechter says. For those who don’t have the time or flexibility to devote to a story of such length, shorter podcasts can serve a similar purpose. Lear teaches a senior elective on racial depictions in American forms, and assigned a Radiolab story, “Ghosts of Football Past,” for its rich content. One of Godsey’s most memorable classes involved listening to "Pardon the Interruption," an ESPN podcast, which addressed commentator Bill Simmons’ suspension from the sports network for slamming football commissioner Roger Goodell. In another class, Godsey put on a "This American Life" podcast, “Is This Working?” on discipline in school. “Teachers are desperate for new resources,” she says, and public radio stories, which are known for being authentic, accurate, well told and sharply edited, are ideal for sparking student interest. For a class on the birth of the labor movement, for example, Listen Current recommends a public radio podcast that includes archival sound, music and voices. “If you give teachers content-based audio, you’ll get so much more student engagement,” says Brady-Myerov. To the extent that he can, Godsey is gearing up for "Serial’s" second season. He wonders if the first season’s rollicking success is replicable, at least for his students. Either way, the podcast has rebranded radio as the next new thing, despite the medium’s long history. For students accustomed to the flash-bang of modernity, ambling podcasts in the classroom may be just what they need. *In 2016 Listen Current changed its name to Listenwise.